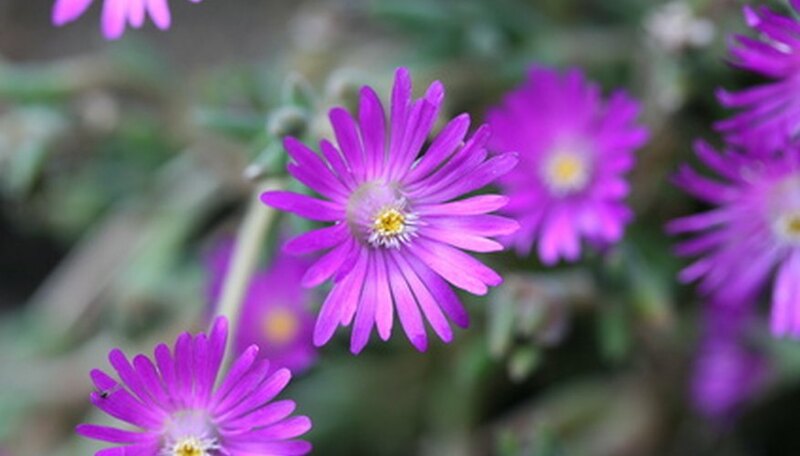 Plants commonly called "ice plants" comprise those once all lumped botanically into a genus named Mesembryanthemum. All low-growing succulent perennials, they conserve water in their leaves, but depending on their native habitats, they tolerate or require differing water regimens. Those native to southern Africa that naturally receive summer rains must not be allowed to dry out like more arid ice plant species. This ice plant genus hails from South Africa where it's called sour fig and thrives in dry sandy soils. In fact, it prospers so well on rocky and sandy sunny soils that in California it chokes out native plants on beaches and is considered invasive. High humidity causes fungal rot, so allow natural rainfall to sustain these plants. Too much rain anytime of year in moist soils leads to death. Usually called the red spike ice plants, those in the Cephalophyllum group appreciate regular watering in a well-draining soil when the plants develop new leaves and are in flower, a time frame of early winter to mid-spring. Greatly reduce watering in the heat of summer. Perhaps this plant genus, Delosperma, comprises the greatest number of ice plant species that gardeners across much of North America know and grow. These cold-hardy succulents manage to survive with a little moisture in the heat of summer, but appreciate regular watering or rains when growing. Of course, do not overwater, as light waterings just to sustain plump foliage and ample flowering is the goal, not encouraging stem and leaf rot. Members of the Drosanthemum genus also appreciate water in summer when they actively grow and flower. Reduce watering in their well-draining soils in autumn and winter. The Lampranthus species of ice plants was once called Oscularia, something to note when looking through garden literature dating earlier than the year 2000. There are scores of species, all of which need watering during the spring or summer when they flower and put on new growth. Diminish watering from autumn to early spring so stems do not rot away. Many of the Lampranthus ice plants gain favor as hanging basket specimens since their stems grow so long.